Lindsay Mason: Normal service is resumed...I hope! Normal service is resumed...I hope! Many apologies for the looooooong time since I last posted on my blog. Unfortunately it's been nigh on impossible due to some sort of ad page that has been coming down over the screen whenever I've tried to add anything here. Gggrrr! No matter what I've tried it has just kept blocking my view of my page and made it a nightmare to try and post. Fingers crossed though (sshhhh...) it seems to have righted itself at the moment so I am hoping that I can resume normal service. I've been busy with my Studio Workshops...those of you who know how often I travel long distances, lugging heavy bags around, will guess what a nice change it is for me to be teaching from home! Above are Karen and Sandra during a recent class - getting messy with DecoArt Media Misters...my studio walls have been getting the odd spritz too! Below are Linda and Cindie sanding back Chalky Finish for Glass which they had painted onto textured glass candle jars...just one of the projects they completed during the day. More details of my Studio Workshops can be found in the sidebar on the left. ....we feel we have a real bond of friendship now. It's also Thomas's favourite sun spot and he loves nothing more that sitting beside me there. Here he is guarding my knitting for me! ....I'm only up to simple shapes, but that's okay...scarves, cushions, shawls and throws will do! Talking of throws, I did manage to finish the one I was knitting, and decided that it would look just right on the back of the sofa. Tara agreed and also assumed that I had put it there just for her! Needless to say, it is looking more like a felted blanket every day as she delights in paddling her claws up and down in it....never mind! 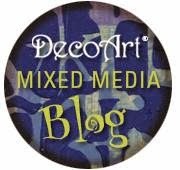 As well as my usual work, I've been busy doing more with DecoArt products as I'm on the International Design Team. This is the latest project that I created for the Mixed Media Blog which has step by step photographs that you can find here. It's a great blog which is well worth bookmarking - regular projects with great instructions from a range of designers. This is a canvas that I recently added to my Etsy shop - also featuring the brilliant Media Misters. I really loved the way the colours came together on this one. ....Mr Hedgie was quite unworried by either me or Thomas and just snuffled on his way into the garden! Well, this is a very random post I know! I've just picked a selection of photos and moments from the last few weeks, but there have been lots of other things happening too. I was the after dinner speaker at a local Tangent ladies group a couple of weeks ago, which was great fun...a few funny reminiscences as well as some simple demonstrations....it seemed to go down well! Design work has been ongoing of course, as well as demonstrations and workshops around the country. ...it's a card within a folded frame which allows it to be free standing. I used a Tim Holtz paper for the frame and then realised that the word "poison" was very obviously plastered across the top! Some Tim Holtz random rubs came to the rescue and did the job of disguising the offending word - you can see them at the top right above the aperture! ....a really lovely day and I'll be there again teaching another workshop on the 18th July - again, details of what I'm up to can be found on the left. Well, this has taken a while but the blocking ad thing seems to have left me alone. I basically had to stay away from the blog so that whatever it was assumed that it was no longer worth pestering me I think! Hopefully it's done the trick and I shall resume normal service.Meanwhile,I do also have a Facebook page which is a public one, so you can always check that if I go missing again! My thoughts too. Your Blog has been missed. I was having the same problem with my computer and finding it very frustrating. Was advised that 'my router had been hacked' !!!!! Don't know what that means but changed router and all OK now (fingers crossed).